Vladimir Seput, a student on Birkbeck’s MA Film Programming and Curating, discusses a recent event looking at Belgian cinema. On Wednesday 21 February, Birkbeck Institute for the Moving Image was once again filled with people. This time, BIMI hosted Belgian film lovers (and those who might become ones) who came to watch and listen about the latest trends in Belgian cinema in a special, introductory event to the programme, Focus on Belgian Cinema. With the support of Wallonie-Bruxelles International and Flanders House, film critic and author Louis Danvers and Wouter Hessels, the film lecturer and cinema programmer at the Brussels Royal Institute for Theatre, Cinema and Sound travelled across the Channel to give talks on the state of contemporary Belgian Cinema. Mr Danvers talked about French-speaking films from Wallonia and Brussels and the often paradoxical situation that they are facing, namely because they cannot reach large audiences even though they regularly win numerous major awards at international film festivals. For example, the Dardenne brothers still hold the record, among a few others, of the highest number of precious Cannes’ Palme(s) D’Or. Even so, their movies often struggle with reaching a significant amount of audiences. Unfortunately, the reasons for such a poor result on the domestic market are, as often, multiple and complex. Besides the fact that the subject of those works is often the gloomy topic of social injustice, which is hardly a crowd-pleaser anywhere, French-speaking Belgian cinema lacks infrastructure that would help in the promotion of films outside their habitual audience. Such infrastructure exists in Flanders, Mr Danvers said, and it would be beneficial to have it in the French part as well. As a result, in 2016 the most successful Flemish film in terms of audience attendance did 15 times better than the most popular French one. However, French-speaking Belgian cinema is a prolific creative industry of a rich documentary tradition and often surreal fiction films, with the latest trend in making films inspired by true events, such as A Wedding (Noces) from 2016, also part of this year’s festival. Genre cinema is often a key to success if a film wants to reach a large audience and Flemish filmmakers know that quite well. Under the title Belgian Cinema: Made in Flanders Wouter Hessels presented the Flemish film wave which started in 2002 and the conditions that preceded it. Mr. Hessels emphasized five key elements of success of Flemish films in recent years: founding of the autonomous Flemish Film Fund (VAN) in 2002, introduction of the tax shelter in 2003, the project Faits divers by Flemish commercial television VTM, numerous international film festivals in Flanders like Ghent, Ostend and Leuven and the increase in quality of student films realized at five different schools in Flanders. Some of those conditions resulted in commercial and/or artistic successes through the works of filmmakers like Felix van Groeningen, Fien Troch and Erik van Looy, whose film The Loft from 2008 holds the record for the most popular Flemish film (more than one million tickets sold). 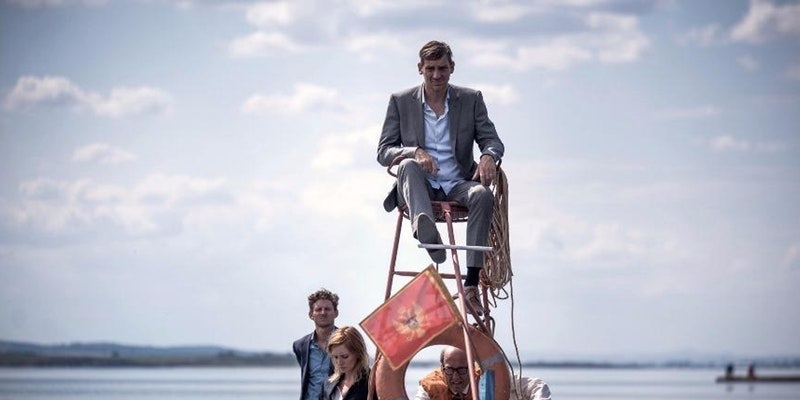 After the presentations on French-speaking and Flemish Belgian Cinema, BIMI screened the film King of the Belgians from 2016 made by Peter Brosens and Jessica Woodworth. The film presents a new direction for Brosens and Woodworth who were, prior to this film known primarily as documentary filmmakers. In this satire, they tackled the issue of a Belgian division in an almost farcical way, inspired by the Belgian mockumentary tradition of comedy making, best known from the cult Belgian film Man Bites Dog from 1992. Along with the five latest titles from the Belgian film factory, Man Bites Dog will be shown at the French Institute as a part of Focus on Belgian Cinema. The event was concluded by a discussion chaired by Janet McCabe, director of the Film Programming and Curating MA at Birkbeck in which Mr Danvers and Mr Hessels talked about different aspects of the creation behind co-existence and shared with the audience their thoughts on encounters between identities, cultures and languages. Focus on Belgian Cinema runs at the French Institute from 22-25 February. For more on Belgian cinema, see Wouter Hessels’ choice of most representative Belgian films.